Richard Harris runs a mixed farm in Alkmonton near Ashbourne. They milk 150 Pedigree Ayrshires running alongside a Pedigree suckler herd of Limousins consisting of 30 cows with followers, 300 ewes and 200 acres of arable. Top quality bulls from the Saltbrook herd of Limousins are sold as stock bulls and in order to get them into prime condition, they are fed a coarse mix from HJ Lea Oakes. The mix is 16% protein with relatively low starch, added alfalfa, soya oil and actisaf yeast. Richard felt that the alfalfa added protein but was a ‘rumen stimulant’ and that the low starch content of the mix ‘helped improve thetemperament of the bulls’ growing them without causing any rumen upset demonstrated by a desirable muck consistency. This was also aided by the actisaf yeast with the soya oil helping to give the coat a nice shine. 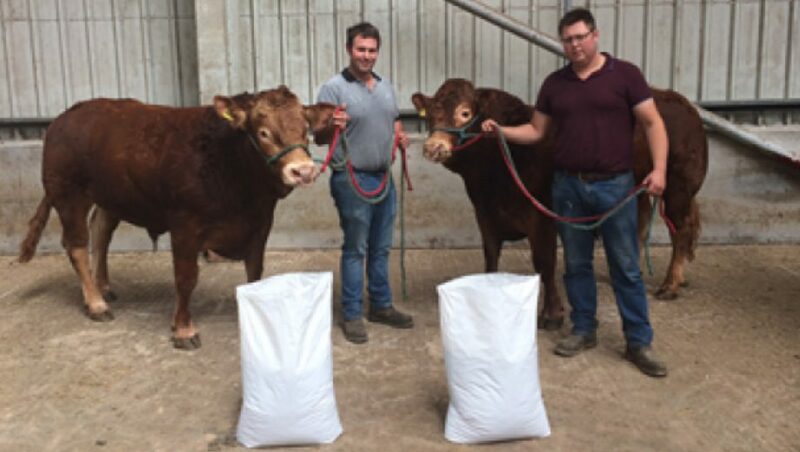 Richard said that he had used a range of other mixes and feeds but that he wouldn’t use anything else to get his bulls in the best condition to sell.